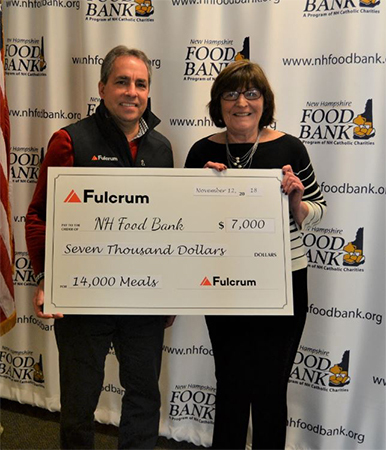 Bill Jean, left, Fulcrum Associates’ director of business development, presents Nancy Mellitt, director of development for the NH Food Bank, with the a $7,000 donation resulting from the Amherst-based construction management firm’s annual Charity Golf Classic held in September at the Manchester Country Club in Bedford. After 18 years, CBRE Inc. and CBRE|The Boulos Company Inc. have agreed to end their affiliate relationship in Portland, Maine, effective Dec. 31, when Boulos will once again operate as a fully independent firm under the name The Boulos Company. Big Green Solar LLC has acquired eight solar PV rooftop arrays under development on the campus of Dartmouth College in Hanover from project developer ReVision Energy Inc. The arrays have a capacity of 473 kilowatts. A loan for the acquisition was provided by Coastal Enterprises Inc., a Maine-based community development bank. Big Green Solar is owned by William Hoyt, a graduate of both Dartmouth College and its Tuck School of Business. Merrill Kramer, project finance partner in Pierce Atwood’s Washington, D.C., office, led the transaction with support from Kris Eimicke, a tax partner in the firm’s Portland, Maine office, and Krystal Williams, an energy associate, also based in Portland. Kat Howland has joined Raymond-based Jewett Construction Company as marketing manager. Howland previously worked at The Partnership for a Drug-Free New Hampshire, where she managed two statewide educational campaigns. North Branch Construction of Concord has completed renovation of the Blunt Alumni Center on the Dartmouth College campus. The 50,000-square-foot renovation took place over a period of seven months on all four floors of the building while the facility remained occupied throughout construction. Renovations included an air conditioning system, a ducted heat recovery ventilation system, new lighting, new teledata infrastructure, new windows and new finishes. Studio Nexus Architects & Planners of White River Junction, Vt., provided architectural design for the project.